Southwest Shakespeare Company was back this past weekend at Taliesin West, the Frank Lloyd Wright School of Architecture up on the northeastern edge of Scottsdale. The show? 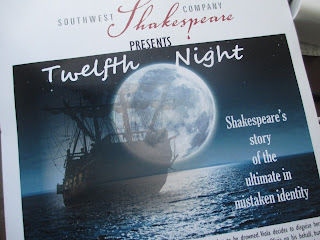 The education touring show of Twelfth Night. That is, the show that students get to see performed at their schools (as opposed, of course, to when the schools go to the theatre to see a daytime performance of a regular production of the season). As such, the show was shorter and kept the minimalist set approach. They also had more of what I want to call the modern approach: the actors moved in a way to create the storm at the beginning of the plot, things like that. And they all sat on chairs at the back of the stage when they weren't the ones up front performing. It all felt very actors' workshop to me, which I'm sure is the idea. Instead of just giving students a good play, they also want to give them a glimpse into what it's like to put a production together. Sound familiar? My theme for yesterday's post (in which I focused on the behind the scenes look) continues into today. Particularly as I get into, once again, what came after the show ended. They also gave us a look at what it was like, in Shakespeare's day, for actors to receive only their own lines (along with cue lines). A few actors went up and performed unrehearsed scenes together based only on paper lines that they were given. That gave the audience an inside look not only on the history of Shakespeare but also on what it's like to perform: there is so much that an actor can bring apart from what a director might tell them to do. My reaction to this evening's event is very similar to what I said about Aria Jukebox yesterday: I can't say I enjoyed it as much as usual, but I did enjoy getting that behind the scenes glimpse. And of course they were also giving us the opportunity to see what the education side of the company is up to, which is nice: touring shows can end up having to much influence on people.